Below is the information from Polar (copied verbatim!) from The Polar Site. I’ve installed this without issue on my watch and everything seems to be working. This is a huge step forwards for the Vantage and adds most of the missing functionality to make it work in most normal training scenarios. Although I think Polar got here faster than most of us thought they would, I also feel that they need to make update cadence more regular. We don’t need 5 new features in each update, just drop whichever features are ready once a month. Some of these things could easily have been delivered in a smaller update earlier while we waited for the big stuff. If Polar are to compete with “the big boys” then they will need to really grasp the concepts of modern development and delivery. I certainly don’t want an update every week or fortnight, but quarterly is not enough here. The problem isn’t even just lack of updates, it’s that the feedback loop they have is too slow. Because right now they already have plans for the next release, that means that something I feed back to them today, the day after release, won’t be in firmware for at least 6 months. That’s 6 months in which Garmin will have had probably 6 firmware cycles. Garmin will have implemented, got feedback, changed, got feedback and then perfected a feature. Meanwhile, I’m still not really happy with the backlight functionality on the Vantage V after a couple of updates. It’s at least another quarter until I see whether they fix the backlight. You know what though? My Vantage is my current day to day training watch. I just like it more. I still take the Fenix for outdoor running because it has music and maps, but the Vantage is the one I use to track the training at the moment because (as I previously wrote) it displays the information better which leads to better training outcomes. 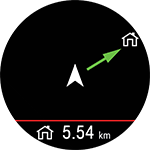 What watch with an OLED gets that kind of battery life when running GPS? I’m also curious, please share details. Still no ability to ‘Change Phase During a Phased Session’. Used to do this a lot on my M400 to incorporate warm up and cool down into flexible length workouts. The ‘start next phase’ is indeed a nice function. I alsi use it regularly on my v800. Might be a valid feature request? Anyone else having problems with route guidance? When it’s on, the watch stops (please press a button to reset) on every hard turn (over 90 degree angle)? It’s unusable for my “let’s follow this track” trail runs. I had online chat yesterday with Polar rep and raised concerns about Vantage performance versus V800. 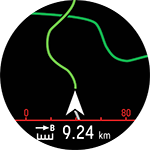 I find the Vantage GPS to be inline with other watches when it works. Occasionally it goes nuts but I’m certain that’s firmware and no worse than Garmin on my Fenix 2 and early Fenix 3 firmwares. The v800 is considered to be the best out there, but man is that a big watch! if you need instant pace you’ll want a footpod anyway. If you don’t need instant pace for intervals then GPS, even poor GPS is just fine and is technically more accurate than footpods when changing terrain and elevation since GPS can measure distances while footpods can’t.